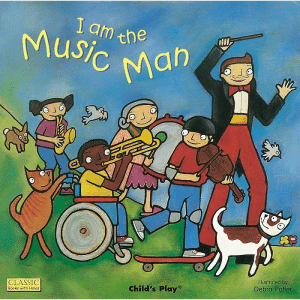 I am the Music Man is an engaging book based on the popular children’s song. This book combines the fun of lifting flaps to discover the next instrument and each page has lots of subtle changes to discover. This song is language rich and kids can easily pick up the key phrases: “I am the Music Man; I come from down the way; And I can play? ; What can you play? 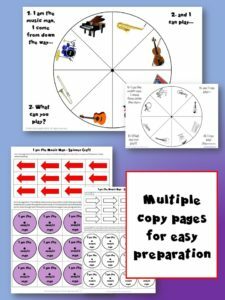 ; I can play the…” The obvious vocabulary topic is Music but the images in this book also allow you to practise Home, Family and Pet vocabulary easily. 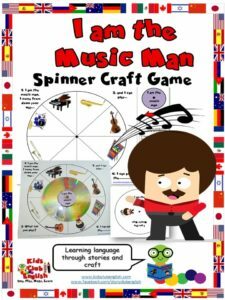 Attractive card sets starring musical instruments, pets and people vocabulary that you can use in conjunction with the I am the Music Man song or story book OR as part of a unit on music, pets or people. Detailed Activity Suggestions are included with games you can play with the matching and mini-cards. A great resource to have ready for fast finishers too. 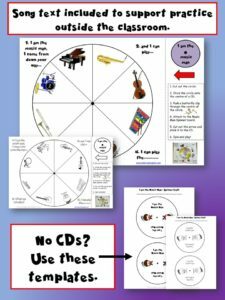 This Spinner game provides several opportunities to practise music vocabulary both in the making of it and in playing with it afterwards. Playing the game supports the development of social skills, as well as communication and language. Great to take home and play with the family.